Baseball is a game of traditions: keeping score, drinking awful beer, mocking the loathsome St. Louis Cardinals, and complaining about how nearly endless World Series games are ruining the sport and alienating the children, who are our future. 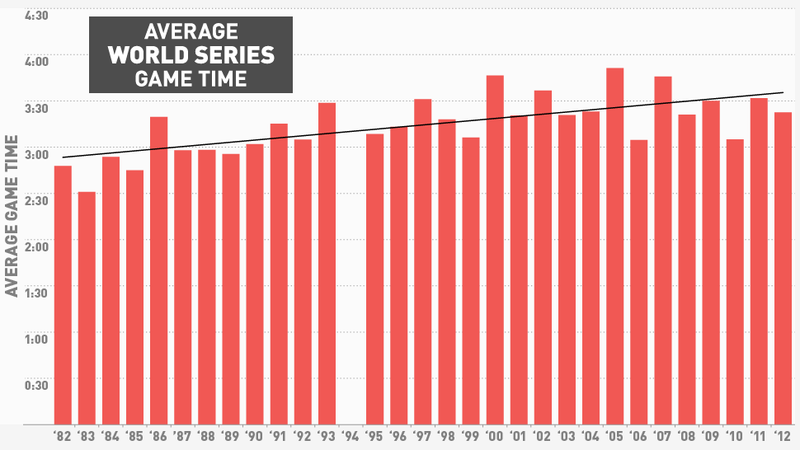 It may or may not actually be alienating the children, but World Series games are, in fact, getting more nearly endless. As you can see from the chart above, the trend line is moderate, but has sloped ever upward over the last 30 years. At the extremes—comparing, say, the fondly remembered by no one 1983 Series to 2011's taut, gripping classic—the difference in average times between individual World Series reaches an hour. More generally, over this time the typical game in the typical World Series has gone from being around three hours to three and a half hours, with most of the difference presumably having to do with batters stepping in and out of the box, pitchers engaging in meditation before beginning their delivery, Viagra advertisements, and other tension-diffusing events. If only there were some central authority charged with protecting the best interests of the game, something might be done about this.